Serendipity paved the way for Aileen Cho to build an enduring career writing about the world’s most innovative transportation and infrastructure projects. For more than two decades, she has reported on airports, roads, ports, rail systems, bridges and other infrastructure developments as senior transportation editor at Engineering News-Record. Cho had no idea what her career path would be when she enrolled at Occidental College, a liberal-arts college in Los Angeles (and the alma mater of former U.S. President Barack Obama). But a journalism course opened her mind to possibilities. “The class was taught by a reporter at the Orange County Register who singled me out as someone who could be a successful journalist,” she says. The professor urged Cho to apply for a minority editing program at the Los Angeles Times. She earned one of a few coveted slots in the two-year program and began learning the ropes from veteran reporters at one of the nation’s largest daily newspapers. During the second year of the program, several East-Coast affiliate newspapers traveled to LA to recruit cub reporters for their publications. “I got sent to the Greenwich Time in Connecticut, and that’s where the turning point happened, because the only available beat was transportation and public works,” she says. Cho began writing about many facets of transportation—from her experience taking a flying lesson to riding with the Coast Guard. And the newly enacted Intermodal Surface Transportation Efficiency Act of 1991 (ISTEA) led to a series of newsworthy infrastructure improvement projects, including several Metro-North track and station upgrades, the repaving of Interstate 95, and a new terminal at Westchester County Airport. “Suddenly I had all of these news clips that had to do with transportation construction,” she says. Despite having written extensively about transportation, Cho discovered she still had much to learn. Early on in her ENR tenure, Cho also discovered one of the most appealing perks of the job: the opportunity to travel around the world and experience awe-inspiring projects. Her first on-location assignment outside the region was in Aiea, Hawaii, where the Admiral Clarey Bridge (also known as the Ford Island Bridge) was under construction. “It was fascinating to learn about this unique kind of floating pontoon bridge,” she says. Women engineers, in particular, went out of their way to encourage Cho. These advocates included Connie Crawford, who served as chief engineer at the New York City Transit Authority; and Ginger Evans, the first female to receive ENR’s Award of Excellence for her role in directing construction of the new Denver International Airport. “They—and several other women and men—just took me under their wing. They’re a huge reason why I’m still at ENR,” she says. Through the years, Cho has written about numerous iconic projects: from the historic expansion of the Panama Canal to the construction of an enormous seawall in St. Petersburg, Russia. Closer to home, she’s covered the World Trade Center transportation hub and several New York City subway projects, including the U.S. Army Corps of Engineers work dewatering the city’s subway tunnels in the aftermath of Hurricane Sandy. Among the most inspiring projects Cho has written about is the Arthur Ravenel Jr. Bridge over the Cooper River in Charleston, S.C. “It was extraordinary because it’s what every bridge project wants to be: on-time, on-budget and technologically advanced. When I toured it, even the contractors were enthusiastic about it,” she says. 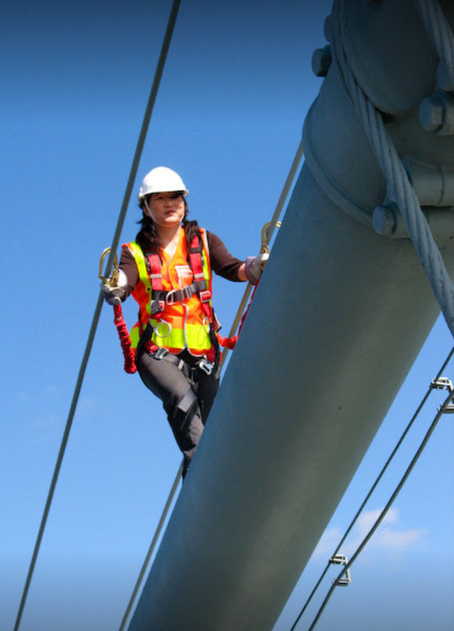 More recently, Cho has traveled to Turkey and Greece to cover various road projects, and she’s currently working on an ENR cover story about the new Champlain Bridge in Montreal. Two years ago, Cho chose to relocate back to the West Coast to be closer to her parents (and a more temperate climate). She now works remotely from Long Beach, California, but stays closely connected to her ENR co-workers via technology. “I always tell people that if there was a zombie apocalypse, I would want to be with my ENR colleagues in the New York office because they’re the ones I trust,” she says. In a media landscape characterized by consolidation and turmoil, Cho’s career has been remarkably stable and resilient. With a history that dates back nearly 150 years, ENR is among the most resilient and respected industry publications, with a print circulation of more than 60,000. Since 2015, it has been published by BNP Media. 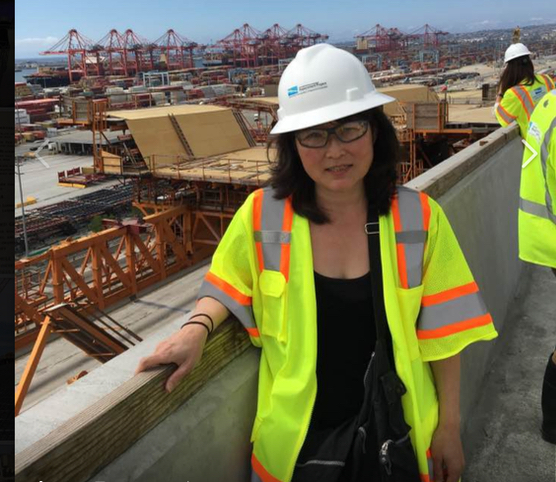 Cho visiting the Gerald Desmond Bridge replacement project in Long Beach, Calif.
What are the Greatest Challenges Facing A/E/C Firms?